It is with great sorrow that we share the news that Ryan Johnson, 34, and Marc-Andre Leclerc, 25, missing in the Mendenhall Towers of Alaska, are now presumed dead, according to Alaska State Troopers involved in the search. Friends and family members last heard from the two men via text message and Instgram on March 5, the day that Johnson and Leclerc completed a new route on the north face of the Main Tower, about twelve miles from Juneau. Since March 8, members of the Juneau Mountain Rescue (JMR), Alaska State Troopers, the United States Coast Guard, the National Weather Service, along with friends, family and other groups and individuals, have been working together to coordinate the search for Johnson and Leclerc. According to press releases from JMR (which can be found on the organization's Facebook page), a series of helicopter flights examined "the climbers' planned Mendenhall Glacier exit route, along with their probable ascent and descent routes on the Mendenhall Towers." The searchers soon found a "cache of gear that was not needed for the climb, which included skis, poles and a backpack" below the peak. Over the next few days, often impeded by wind and low visibility, the helicopter and crew continued to look for the men whenever weather windows allowed. UPDATE: On 3/13/2018, weather cleared and search assets were able to be deployed. The chartered Coastal helicopter, with Juneau Mountain Rescue members on board, was able to reach the north face of the Mendenhall Towers. An intact anchor rope was seen at the top of an ice shoot on the 4th Tower. Two climbing ropes were also seen in a crevasse midway down the 4th Tower. The ropes match the description of the gear carried by Johnson and Leclerc. Due to the circumstances, Johnson and Leclerc are presumed deceased. Due to continuing significant avalanche danger and safety hazards, recovery efforts are not feasible at this time. Next of kin for Johnson and Leclerc have been notified. Alpinist is still waiting to confirm more information about the accident. According to Anchorage Daily News, Alaska State Troopers spokesperson Megan Peters reported: "Everything tells us [Johnson and Leclerc] are down in that crevasse and they are presumed deceased." Searchers are not certain whether an avalanche or some other reason caused Johnson and Leclerc to fall into the crevasse, she explained to the newspaper, and avalanche hazards remain too high for anyone to attempt a recovery now. "We do know they ascended, took pictures at the top.... We know they hiked a ridge over to the ice chute near the fourth tower." Both men were among the strongest climbers in North America. Ryan Johnson was a winner of the Mugs Stump Award in 2008, for "climbers attempting alpine climbing objectives that exemplify fast, light and clean tactics." 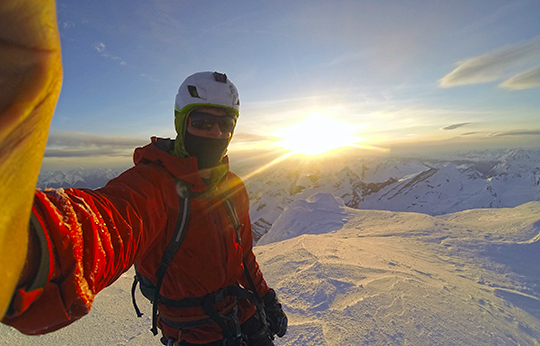 A highly experienced and well-respected alpinist, Johnson had made several previous trips to the Mendenhall Towers, including a first ascent of a route on the north face of the West Tower, with Sam Magro in 2008, and the first free ascent of the South Buttress Direct on the Main Tower with Gabe Hayden in 2011. A year later, Johnson made the first ascent of Fall Line (M5 65 degrees, 1110m) after hiking in from Montana Creek in "an attempt to further promote the 'hike in, hike out' approach ethic," Johnson reported in the American Alpine Journal. "This is not a recommended approach route for this time of year," he concluded by the end of the expedition, yet the trip went well, including "fun" climbing to a "windy, knife-edge summit ridge." In 2013, with Gabe Hayden and Jason Nelson, Johnson established Balancing Act (5.11c 1,400') on the south face of West Mendenhall Tower. In the AAJ, Nelson described the appeal of its "alluring, steep, steel-grey upper headwall." This time, a helicopter dropped them off at the base, but after finishing the climb, they still had to hike out. Although they ran low on food, Nelson noted, "Ryan, with a hobbit-like physique, is uniquely prepared for situations such as these." According to one of Johnson's climbing partners, Clint Helander, "the north face of the Main Tower was Ryan's greatest unclimbed winter project in the Towers." Johnson was also intending to attempt the east face of Mt. Hayes in the Alaska Range, an expedition that had received one of the American Alpine Club's Cutting Edge grants. Leclerc is known for some of the most impressive alpine and big wall ascents in recent years, ranging from enchainments and solo climbs of granite cliffs and rime-coated Patagonian spires to new routes in the Rockies to first winter ascents of vast walls, among many other achievements. Rolando Garibotti, the great alpinist and chronicler of climbing in Patagonia, described Leclerc's solitary ascents in that region as unique in a 2015 interview with Chris Van Leuven for Alpinist.com: "I am not sure there are any other climbers around that have the skills to tackle such difficult climbs free solo, or with so little belay." In his own interviews, blog posts and stories, Leclerc spoke and wrote eloquently about a search for something timeless. After his completion of the first solo winter ascent of Torre Egger, in Patagonia, Leclerc explained to Derek Franz, Alpinist digital editor, "I am not so motivated by grades or records, but more by big adventures and being immersed in wild places." It's hard to put my finger on what the magic ingredient is... it's almost as if it is some kind of innocence and curiosity in the inspiration for the adventure that brings about an open and receptive state of mind. I had a similar experience when I linked Slesse's northeast buttress and north rib some years ago. The adventure had some quality of almost childlike wonder that I have not again felt so clearly on any climb since then, aside from on Robson. It's awfully hard to explain. Kind of like it is hard to recall the exact feeling of being a child discovering something wonderful and new because it is a feeling too removed from our 'adult' state of mind to actually grasp in a tangible way. In a blog post, climbing writer Christopher Elliott wrote of Johnson and Leclerc and others of their generation who made cutting-edge alpine ascents and who passed away in climbing accidents in recent years: "They were the trail-blazers, 'earth-shifters,' record-breakers, explorers of the possible when possibilities were thought already established." It is with great sadness that we update this page tonight. This afternoon after much effort by family, friends, Juneau Mountain Rescue and associated assistance we determined that we have lost Ryan and Marc Andre after their completion of a stunning first ascent on the North face of Main Mendenhall Tower. These world-class alpinists and warm human beings will be sorely missed as is evident by the deep love of their families and friend and the climbing community. Ryan was as equally passionate about fatherhood as he was about alpinism. Funds from this campaign will now go to: (1) Assist family and friends with closure and costs related to Ryan's passing, (2) Assist with Care/Life/College fund for Ryan's 2.5 year old son Milo who will be missing his father and father's support intensely. Thank you for helping in whatever way you can. Your caring and contributions will truly make a difference in this difficult time. Sadly we have lost 2 really great climbers and I lost a son I am very proud of. Thank you for the support during this difficult time. My heart is so broken.... Part of me is gone with him.... Our family appreciates all of your prayers and we would like to ask for a time of privacy as we come to grip with these devastating developments... Marc-Andre was an amazing, loving man and he has touched many lives in so many ways. He will be remembered and loved forever. I know he is with our Lord and I will be with him again one day.